The Media Team is always busy. There are just so many events and activities going on around the school that are to be reported on. Numerous articles have appeared in the local press, with monthly contributions to the Gryffe Advertizer. Every Friday, team members fill the Gryffelife boards with news and this week is the 131st Edition! A huge commitment is the Monthly Newsletter. The team work very hard ensuring that this is ready for compilation and then publication on the first Wednesday of every month. 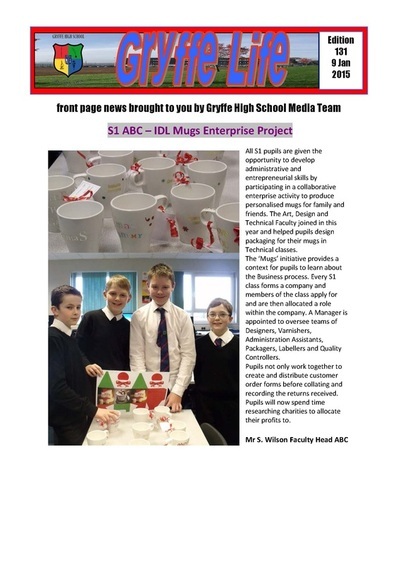 Please make sure that you take time to read it on the school website (under News) and catch up with the achievements of the pupils in the school! The Media Team also take part in BBC News School Report Day. The Media Team meets on a Wednesday after school (by arrangement). We are always looking for hard working members to join the team from S1 to S6! Pupils can choose to be journalists, photographers or both! On Thursday 19th March 2016, the Media Team went to the Carrick Centre to interview members of the public, inquiring about their knowledge of the Partial Solar Eclipse, which is happened on Friday 20th March 2016. This was to help them in the BBC News School Report. 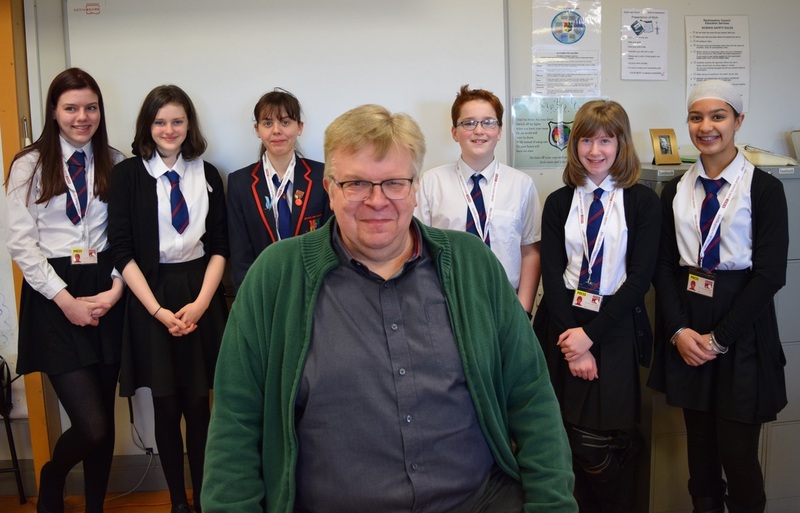 The Media Team had an exciting visit from BBC Science Correspondent Kenneth MacDonald. The special guest came in preparation for the BBC School News Report Day on the 10th of March. Kenneth spoke to the team about how to ask the right questions when interviewing. The reporter also spoke a little about his experiences over the 18 years that he has spent with the BBC. The team also took the opportunity to ask Kenneth about what life is like as a journalist and Kenneth had plenty of interesting stories to share with us. This year, the Media Team will be taking a visit to Paisley Museum to research the exhibits and talk to some staff, before returning to write some articles under a tight deadline! This will give the team a taste of what being a real journalist is really like. The Media Team would like to thank Kenneth MacDonald for taking the time to come and speak to them. Inspired is an exhibition at Paisley Museum centred entirely round young people. It is “a reflection of the personal perspective of the young artist and the things which inspire them.” The exhibition is tied close to Gryffe High School as several of our pupils have paintings featured there. The Inspired Exhibition has a large room full of classic paintings which students from local schools have matched to classical music. The children were played the music and asked to find a painting they felt accurately portrayed the emotion behind the music. When the music was added to the paintings, they became more like films. Two pupils Ciaran and Joshua from primary seven in St Charles Primary took part in the activity. This is what they had to say. The boys matched Symphony No.10 (2nd Movement) by Shostakovitch to the painting Hallowe’en by James Elder Christie. You can hear the piece and see the painting at Paisley Museum and Art Galleries on Paisley High Street. The exhibition also featured original artwork by students of all ages, divided up into different categories; creepy crawlies and slimy things, the circus, horses, darkness and light, trees and open category. Several S5 Gryffe pupils were featured in the open category section including Calum Taylor with ‘The Poker Game’, Gemma Elmes with ‘Textures of Cornwall’, April Kelly with ‘Washed Ashore’, Nian Lin with ‘Old and New’ and Hannah Paterson with ‘The Nightmare’. The Nightmare was even featured on posters and leaflets advertising the exhibition. The Gryffe High School Media Team would like to thank Paisley Museum for letting us in early, showing us around and for allowing us to interview their staff. We recommend you head on down to Paisley Museum to have a look at the Inspire Exhibition. It is, as the name suggests, quite inspiring. On the 10th of March 2016, the Gryffe High School Media team visited Paisley Museum. We did this to be part of BBC News School Report day. We saw some of the pieces of art made by primary and secondary school pupils in the Inspired exhibition. There are pieces of art for lots of different schools and ages from nursery to S6. Most of the Inspired work are will go into a national competition. There were a few entries from Gryffe High School. We also saw Buddy the Lion who is a big attraction for the Museum. He is a massive stuffed lion. The lion was provided by E.H. Bostock’s zoo in Glasgow. Buddy was originally mounted with a lioness and four cubs. He first went on display in the pillar gallery on April 26th 1926. The Media Team are looking forward to participating in BBC News School Report Day again this year on Thursday 15th March 2018. This will be the 7th year that we have taken part. GHS Media at Makewaves. Free school websites for digital badges and safe social networking.